Mount Moran (12,610 feet (3,840 m)) is a mountain in Grand Teton National Park of western Wyoming, USA. The mountain is named for Thomas Moran, an American western frontier landscape artist. Mount Moran dominates the northern section of the Teton Range rising 6,000 feet (1,800 m) above Jackson Lake. Several active glaciers exist on the mountain with Skillet Glacier plainly visible on the monolithic east face. 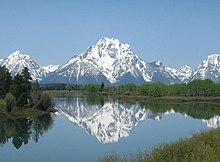 Like the Middle Teton in the same range, Mount Moran's face is marked by a distinctive basalt intrusion known as the Black Dike. On November 21, 1950, a C-47 cargo plane owned by the New Tribes Mission crashed on Mount Moran during a storm, killing all 21 on board. A rescue party organized by Paul Petzoldt located the wreckage on November 25, but the extreme location of the crash made it impossible to recover the plane or the bodies. The wreckage remains on the mountain today, but the Park Service discourages direct climbs to the site. ^ "Mount Moran". Geographic Names Information System. United States Geological Survey. Retrieved 2011-05-28. ^ Ortenburger, Leigh N.; Reynold G. Jackson (1996). A Climber's Guide to the Teton Range (3rd ed.). Mountaineers Books. ISBN 0-89886-480-1. ^ Roper, Steve; Steck, Allen (1979). Fifty Classic Climbs of North America. San Francisco: Sierra Club Books. pp. 165–170. ISBN 0-87156-292-8. 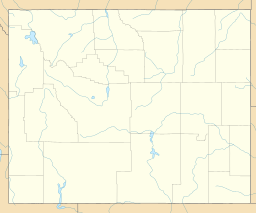 Wikimedia Commons has media related to Mount Moran. This page was last edited on 1 August 2018, at 03:48 (UTC).